HR Wallingford’s model predictions of an example major storm surge event (1 in 20 year return) around the U.K. coastline. Recent severe flooding around the U.K. coast is a stark reminder of the risks presented by storm surges – caused by a combination of high tides, winds and low pressure. The impacts on people, property and infrastructure, as recent events in Dawlish illustrate, can be significant. Storm surges, and their potential impacts, need to be understood by coastal managers, affected communities and all those with assets on the coastline. 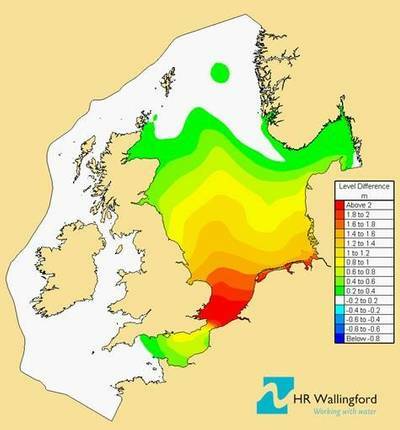 International flood and coastal engineering specialist HR Wallingford has developed SMARTtide, a state of the art tool that can now be used to predict storm surges in U.K. waters. 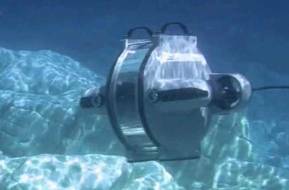 Developed by HR Wallingford, SMARTtide was originally commissioned and funded by the Energy Technologies Institute (ETI) to identify the most efficient sites for tidal energy converters, tidal arrays or tidal barrage schemes around the U.K. and French coastlines. The model continues to be used for this purpose and can now also be used for storm surge simulation.